Hailed by critics as a violinist that “has the power to captivate the five senses of her audience” La Vanguardia (Spain), and described as a “charismatic violinist who possesses, along with her musical talent and tremendous aura, a gift for expression” Neue Press (Germany), Eva León has become one of the most successful Spanish violinists of her generation. A native of The Canary Islands, Ms. León has won the major Spanish violin competitions and several international competitions, including top prize at the Michaelangelo Abbado International Violin Competition, and Laureate at The Maria Canals International Violin Competition. In 2006, Eva León won the 33rd Artists International Annual Debut Prize in New York which led to her debut at Carnegie Hall. Ms. León has successfully appeared on tour in some of the most prestigious music halls and festivals throughout Europe, the United States, the Middle East and Latin America to great audience and critical acclaim. 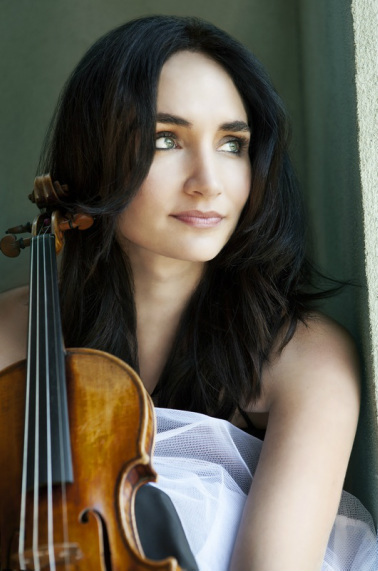 A few of the many orchestras with whom she has performed internationally as a soloist include the Mexico State Symphony Orchestra, the Moldavia National Philharmonic, the Boston Classical Orchestra, the Colombia National Symphony, the Champaign-Urbana Symphony, the Arthur Rubinstein Philharmonic, the Rockford Symphony, the Castilla y León Symphony, the Bratislava Chamber Orchestra, the Galesburg Symphony, the Las Cruces Symphony, the Alter Musici Camerata, the Gran Canaria Philharmonic, the Tenerife Symphony Orchestra, the Del Empordà Chamber Orchestra, the Del Vallès Orchestra, the Cologne Ensemble Orchestra, among others. As a critically acclaimed recording artist for Naxos, Ms. León has recorded an album with music by Joaquín Turina and has recently released a new CD with the complete violin works by Xavier Montsalvatge. She will soon expand her discography with the recording of the complete works by Joaquín Rodrigo due this year. Ms. León has also being featured in other record labels as Moraleda and Klassic Cat and has done numerous recordings for TV and radio throughout Europe, the United States, Japan and Latin America. An article written by Ms. León about Turina’s Piano Trios was featured at the Master Class section at Strings Magazine. Eva León currently resides in New York City where she participates actively in its vibrant music scene while continuing with her international performance schedule as a soloist and a chamber musician. Copyright © 2018 Eva León. All rights reserved.